Feeling inspired with welcome emails? Welcome emails have a soft spot in our hearts. 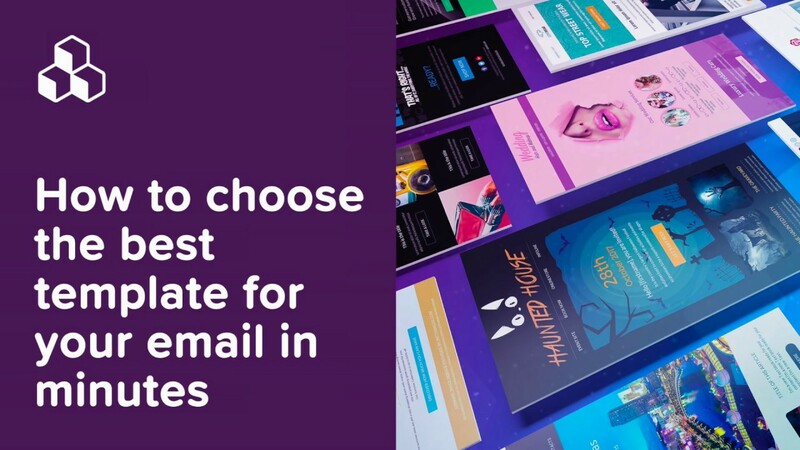 Readers open them more than almost any other email—with average open rates reported at 50% or higher—and they’re a brand’s very first introduction to readers. 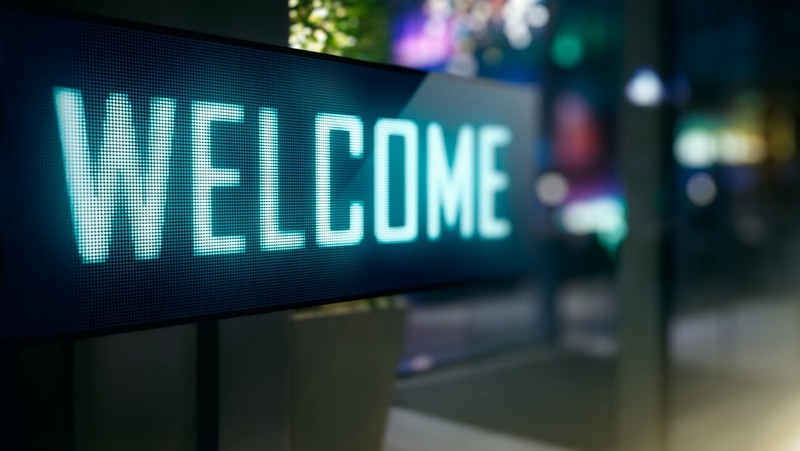 You may remember we’ve talked about welcome email design before, but since then, we’ve received hundreds more welcome emails from all kinds of brands. Today, we’ve picked some of our favorite welcome emails to show you. Each one is well-designed, reinforcing the respective brand’s value proposition and giving readers a warm welcome (and reason to click). We hope you enjoy ogling these messages as much as we did. 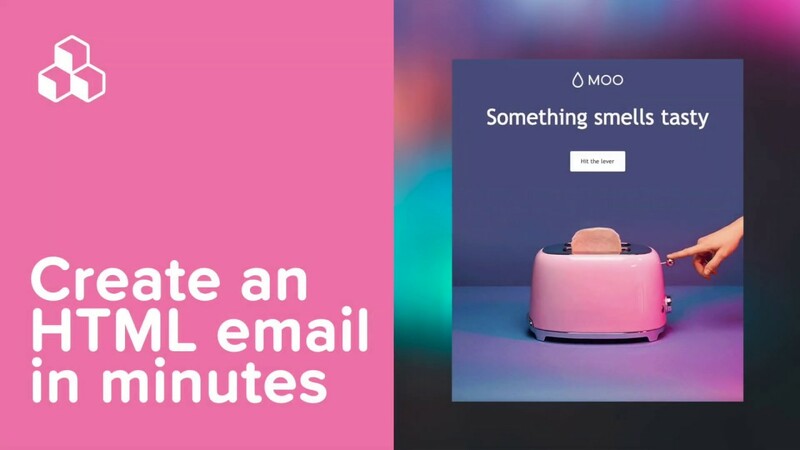 Read on and get inspired to experiment with your own welcome emails! This Allbirds email stands out for its streamlined elegance. The hero image flows seamlessly into a short letter portion of the message, which continues to flow seamlessly into a carefully curated photo collage. 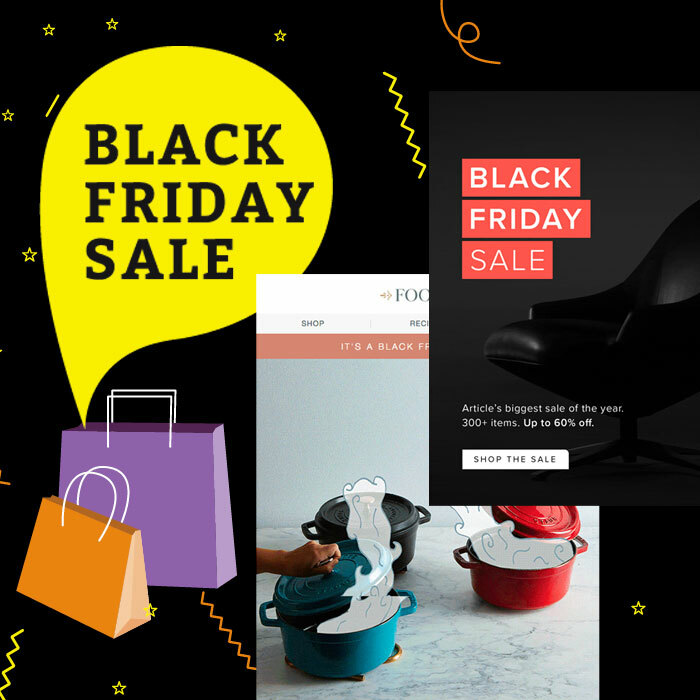 The text is large with ample spacing, and the illustrated hand and shoe photos at the edges give the email a playful, fresh vibe. Notably, there aren’t layers of text: no header and subheader here; no navigation menu, either. Removing any bold summary statement for the body text leaves readers to read, well, just the body text. We love that this welcome email shows you exactly what to expect from Studio DIY. 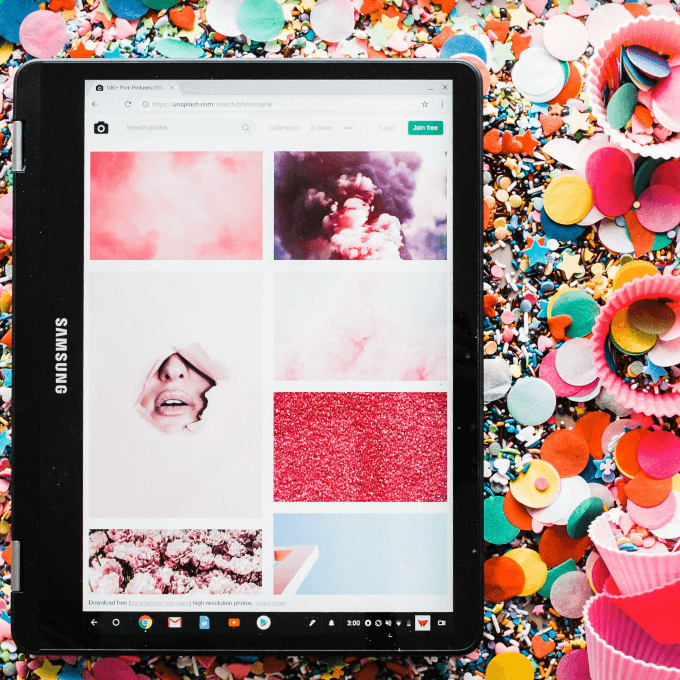 One email is all it takes, and we immediately know: the brand voice and tone (fun, playful, youthful), what to expect from the newsletter (freebies, crafty content), and how grateful Studio DIY is for the sign-up. The Zocdoc app helps you find doctors nearby. We like that this email doesn’t have any frills but still looks great. 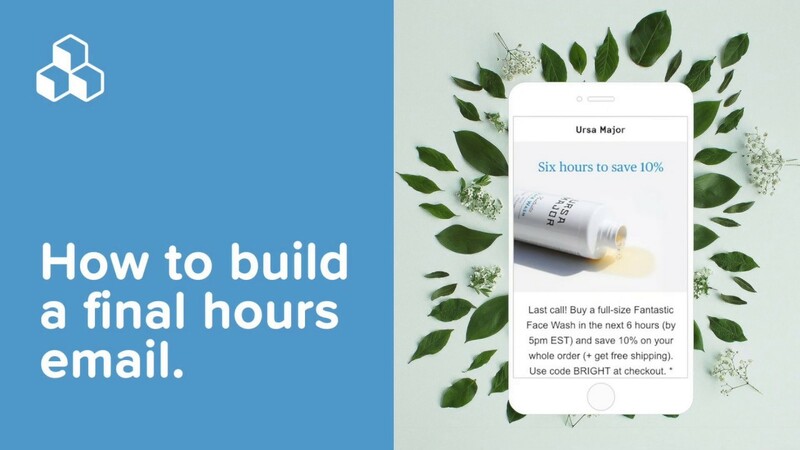 The full-bleed CTA button is easy to tap on mobile, and the boxed effect (using HTML gray as a background color around the white body of the message) really works for an all-text message like this one. 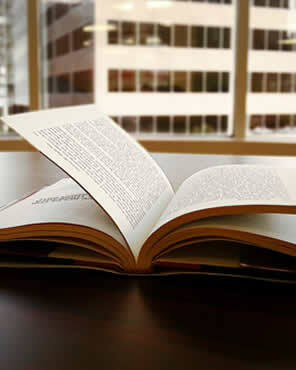 And, the text is kept to a minimum, which makes the email short and effective. 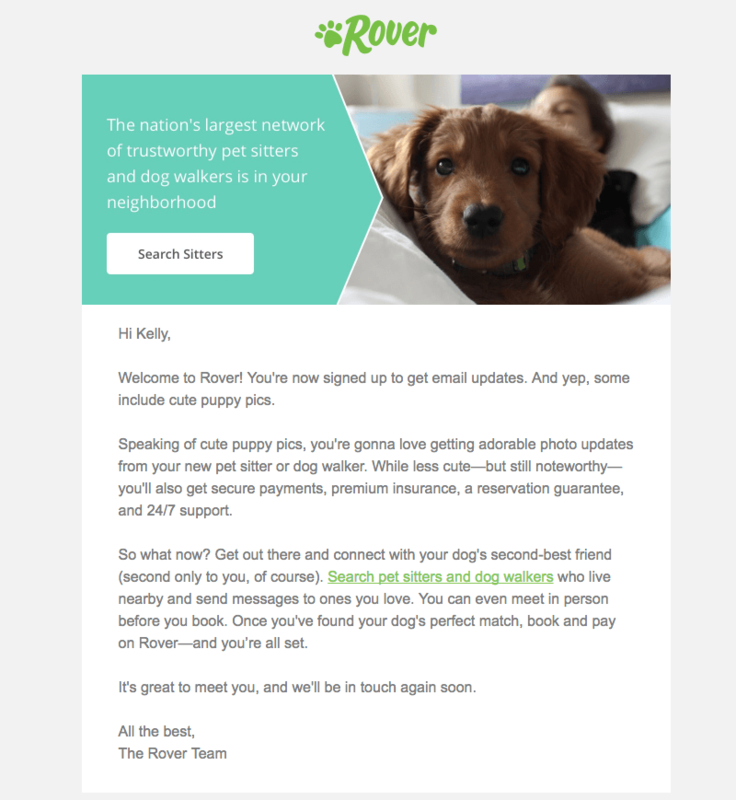 When you sign up for Rover‘s mailing list, the brand’s value proposition is the first thing you’ll read in the welcome email. Reminding readers about your brand and the problem you’re solving for them is exactly the point of welcome emails. And with this Rover email, you can’t miss it. The cute puppy picture doesn’t hurt, either. What’s also great about this email? It uses a personalized first name greeting. If you collect name data during signup, putting it to use immediately in the welcome email is a smart idea. With its vibrant color scheme, this welcome email from Caviar (the food delivery app) is hard to miss. Using a bold color as the background means text and illustration benefits from being streamlined. As a result, all-white text and icons pop with contrast, without clashing with the orange. Even the photos are well chosen. The hero image has orange tones within it, but the mostly white bowl makes the details of the food easy to discern. Brava, Caviar. We’re hungry! At over 800 pixels wide, this welcome email from Travel + Leisure is wider than most. And we can see why. These stunning landscape images deserve the screen. Leading with photography makes sense for a brand like T+L, which operates in an industry that must show readers where to travel next. You can’t just describe a white sand beach; your readers have got to see it. While the email is far from customized—suggested cities like NYC, Paris, San Francisco, and London are pretty generic—its simplicity is effective. 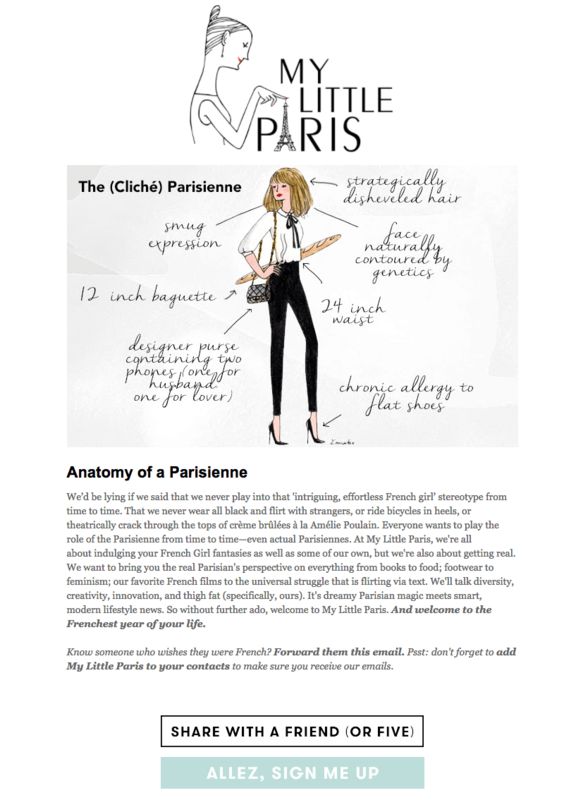 My Little Paris is a newsletter about all things French. 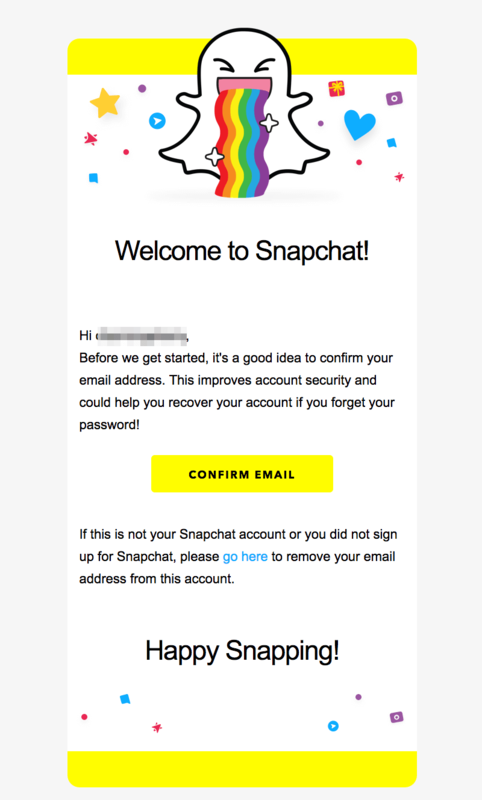 There’s nothing fancy about this welcome email. Compared to others, there’s more text. But, it’s also sweet and short, and it’s representative of what readers can expect in future newsletters. Snapchat is so ubiquitous now that the brand does little to explain itself or its mission. Still, this welcome email says a lot about the brand. And, it focuses readers on the first and most important step by cutting right to the chase. 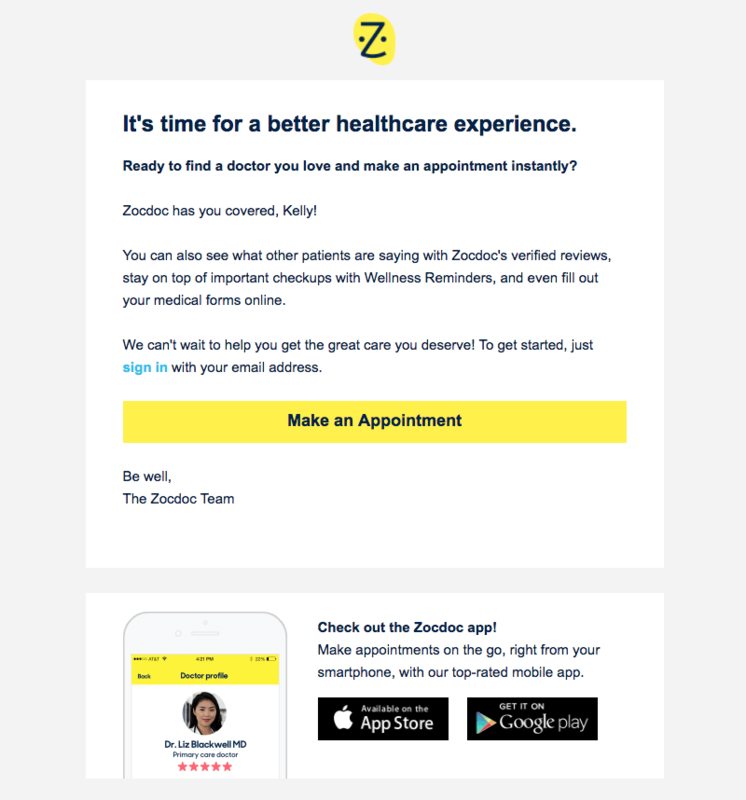 The brand shows an email can be basic while still retaining a sense of fun. You can’t miss that CTA button! 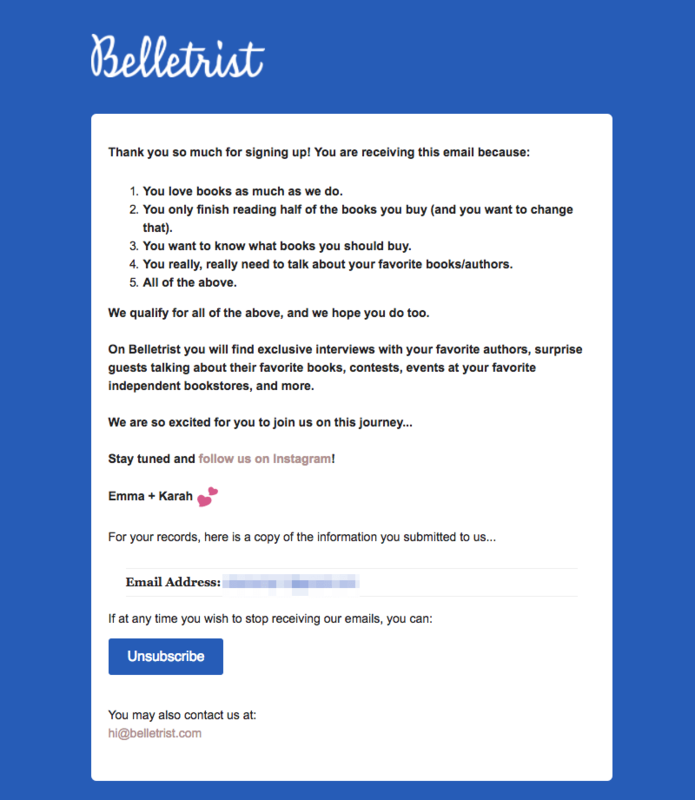 This welcome from Belletrist, the book-centric newsletter, is different from the others we’ve included but still worth noting. We love that the email confirms the brand’s value proposition right away, in list format. And in lieu of photography or imagery, the HTML blue goes a long way in making this email stand out. The whole email also feels like it came from an actual person—or two people, actually—instead of from a robot or faceless brand. Sometimes, going the personal route makes more sense for a brand, especially one that’s smaller and community-oriented. While this message was visually plain, we like what it achieved. But seriously, this email from Brooklinen does a lot to show readers what the brand is all about: simplicity and quality, with a dose of humor. The email also shows you don’t always need to invest in custom art to create a highly effective email. We hope so! 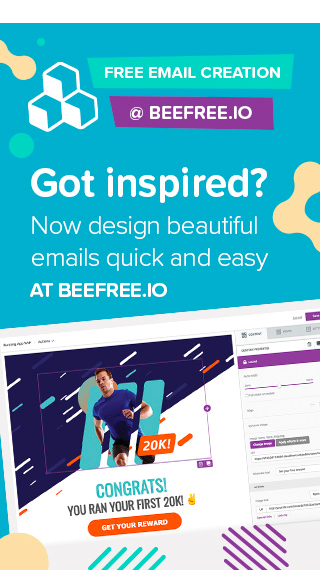 Design your own welcome email with a free trial of BEE Pro. No HTML knowledge is required, plus your email will be mobile responsive. Happy designing!